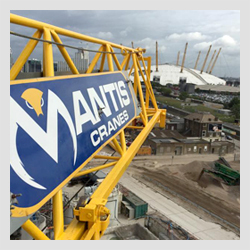 Mantis Cranes is a family run crane hire organisation. With the largest and most diverse crane hire fleet in the United Kingdom. We offer customers the choice from a range of Self Erecting Tower Cranes with jib lengths ranging from 12.7m to 45m and maximum lifting capacity up to 6,000Kg. Mantis also offer a range of City Tower Cranes for hire with jib lengths ranging from 20m to 55m and lifting capacities up to 6,000kg. Manufacturing takes place in a 35,000ft² work space. Mantis has over 15 years’ experience in product manufacturing and expert knowledge in Self Erecting Tower Cranes and City Tower Cranes. 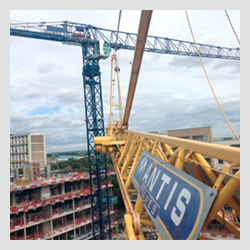 Mantis Cranes Ltd operates the biggest and most varied fleet of Pedestrian Operated Tower Cranes for hire in the UK. We are one of a select few companies who offer cranes specifically designed for timber frame construction. We provide a nationwide crane hire service within the UK, operating from two locations, Durham and Northampton.